This page is being updated, however still has relevant information on the things you can do. The Niseko area offers great backcountry, cat skiing and snowmobiling for those who want to get away from the 3 main Niseko ski resorts. 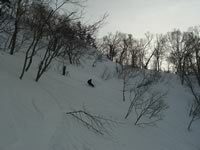 Niseko Weiss Cat Skiing can be very rewarding and a great way to access Niseko's famous powder snow. Located on the east side of Mt. Weiss Horn it is great riding for intermediate skiers and snowboarders. If snowmobiling interests you there are many companies offering snowmobile tours from 1-2 hour first time tours to full day backcounrty access tours. Backcounrty access tours are a great way for more advanced snowmobile riders, skiers and snowboarders to access some of Niseko's untracked powder. If you need a day off the mountain to rest or re-focus you can find many other things to do. 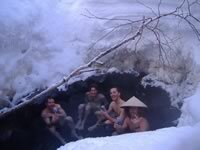 To sooth those aches and pains why not try one of Niseko's famous onsen (hot springs). Other options include local adventure companies offering a range of activities from indoor rock climbing to winter white water rafting. If you need to get out of the Niseko area, Sapporo Japan's 5th largest city, is only 2 hours by bus or train and can be done in a day or overnight. Sapporo o is home to Susukino night district, famous throughout Japan, a place where thousands of bars, izakaya(a Japanese style bar) are open around the clock for infinity. Even just a stroll through this amazing district is a must. Whilst in Sapporo you could also check out some off the local resorts and possibly be nicely surprised if it has been snowing. Other options include ride half pipe in Makomonai or if you are in town at the right time of year, usually February, there is the Toyota Big Air.